Download "STATE OF INDIANA Board for Proprietary Education. Minutes of Meeting. Monday, September 30, 2013"
1 STATE OF INDIANA Board for Proprietary Education Minutes of Meeting Monday, September 30, 2013 I. CALL TO ORDER The Board for Proprietary Education met in regular session starting at 1:00 p.m. at 101 West Ohio Street, Suite 550, H. Kent Weldon Board Room, with Chairman Dr. Ken Sauer presiding. II. ROLL CALL OF MEMBERS AND DETERMINATION OF A QUORUM Members Present: Bruce Bloomberg, Ken Konesco, Joe Pearson, and Ken Sauer Guests Present: Amber Nicole Ying It was determined that there was a quorum for the September 30, 2013 Board meeting. III. 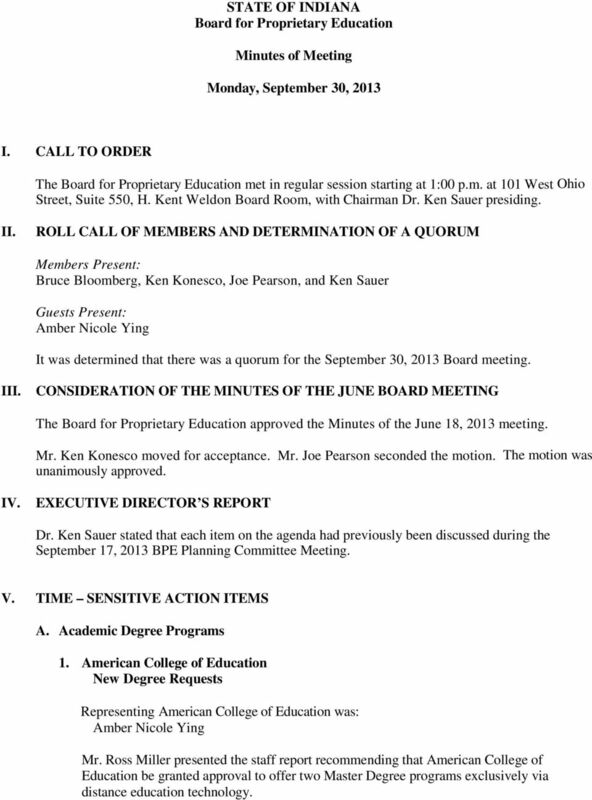 CONSIDERATION OF THE MINUTES OF THE JUNE BOARD MEETING The Board for Proprietary Education approved the Minutes of the June 18, 2013 meeting. Mr. Ken Konesco moved for acceptance. Mr. Joe Pearson seconded the motion. The motion was unanimously approved. IV. EXECUTIVE DIRECTOR S REPORT Dr. Ken Sauer stated that each item on the agenda had previously been discussed during the September 17, 2013 BPE Planning Committee Meeting. V. TIME SENSITIVE ACTION ITEMS A. Academic Degree Programs 1. American College of Education Representing American College of Education was: Amber Nicole Ying Mr. Ross Miller presented the staff report recommending that American College of Education be granted approval to offer two Master Degree programs exclusively via distance education technology. 2 M.Ed. in Instructional Design and Technology M.Ed. in School and Community Health Education Mr. Joe Pearson made the motion to approve the staff recommendation to grant approval to American College of Education to award the above mentioned programs. Mr. Ken Konesco 2. Art Institute of New Degree Request Mr. Ross Miller presented the staff report recommending that the Art Institute of be granted approval to offer one Baccalaureate degree program at the campus. Bachelor of Science in Game Art and Design to Art Institute of to award the above mentioned program. Mr. Joe Pearson 3. 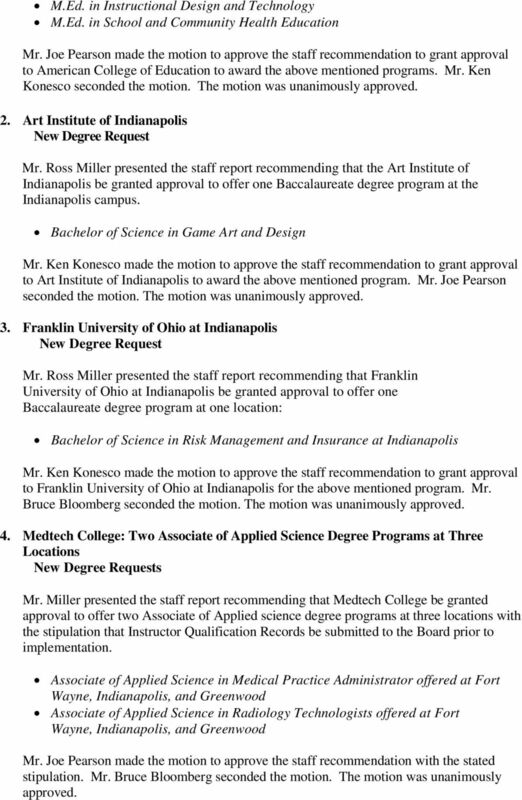 Franklin University of Ohio at New Degree Request Mr. Ross Miller presented the staff report recommending that Franklin University of Ohio at be granted approval to offer one Baccalaureate degree program at one location: Bachelor of Science in Risk Management and Insurance at to Franklin University of Ohio at for the above mentioned program. Mr. Bruce Bloomberg 4. Medtech College: Two Associate of Applied Science Degree Programs at Three Locations Mr. Miller presented the staff report recommending that Medtech College be granted approval to offer two Associate of Applied science degree programs at three locations with the stipulation that Instructor Qualification Records be submitted to the Board prior to implementation. 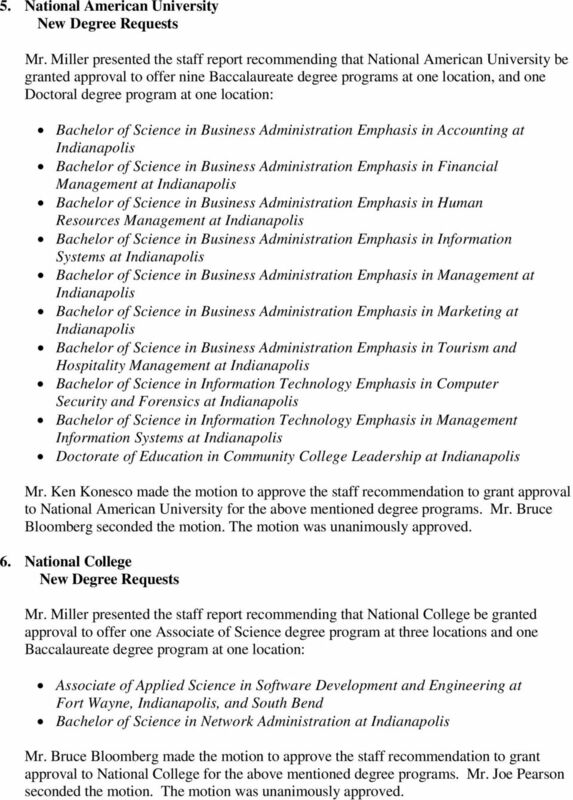 Associate of Applied Science in Medical Practice Administrator offered at Fort Wayne,, and Greenwood Associate of Applied Science in Radiology Technologists offered at Fort Wayne,, and Greenwood Mr. Joe Pearson made the motion to approve the staff recommendation with the stated stipulation. Mr. Bruce Bloomberg seconded the motion. The motion was unanimously approved. 4 7. Radiological Technologies University VT Mr. Miller presented the staff report recommending that Radiological Technologies University VT be granted approval to offer three Master of Science degree programs at one location: Master of Science in Healthcare Administration Executive Specialization Master of Science in Healthcare Administration Oncology Specialization Master of Science in Healthcare Administration Radiology Specialization to Radiological Technologies University VT for the above mentioned degree programs. Mr. Joe Pearson B. Findings of Facts and Conclusions of Law 1. 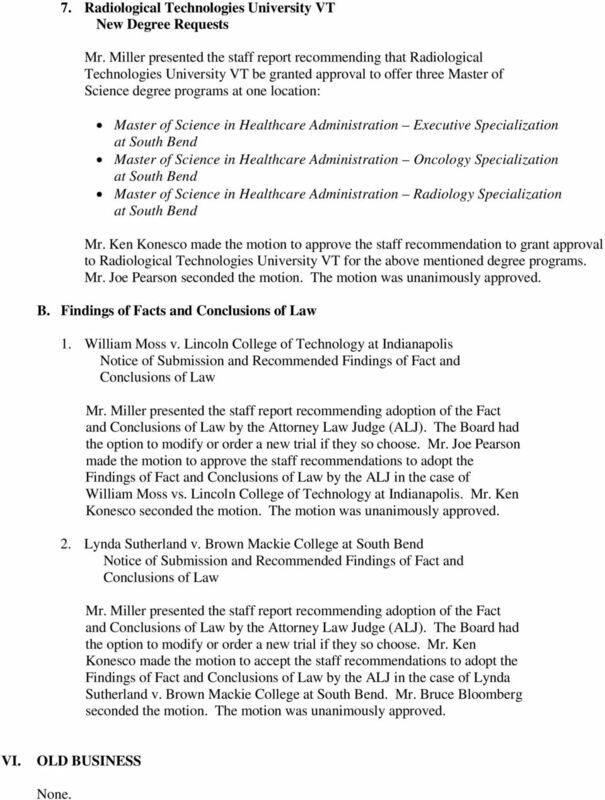 William Moss v. Lincoln College of Technology at Notice of Submission and Recommended Findings of Fact and Conclusions of Law Mr. Miller presented the staff report recommending adoption of the Fact and Conclusions of Law by the Attorney Law Judge (ALJ). The Board had the option to modify or order a new trial if they so choose. Mr. Joe Pearson made the motion to approve the staff recommendations to adopt the Findings of Fact and Conclusions of Law by the ALJ in the case of William Moss vs. Lincoln College of Technology at. Mr. Ken Konesco 2. Lynda Sutherland v. Brown Mackie College Notice of Submission and Recommended Findings of Fact and Conclusions of Law Mr. Miller presented the staff report recommending adoption of the Fact and Conclusions of Law by the Attorney Law Judge (ALJ). The Board had the option to modify or order a new trial if they so choose. Mr. Ken Konesco made the motion to accept the staff recommendations to adopt the Findings of Fact and Conclusions of Law by the ALJ in the case of Lynda Sutherland v. Brown Mackie College. Mr. Bruce Bloomberg VI. OLD BUSINESS None. INDIANA HORSE RACING COMMISSION OFFICIAL AGENDA June 26, 2014 9:00 A.M. INDIANA STATE LIBRARY 315 W. OHIO STREET INDIANAPOLIS, IN 46204 THE AUTHOR S ROOM (new meeting room location) I. Call to Order II. AGENDA. Liability claims, increase from $4,999.99 to $25,000. Worker s Compensation claims, increase from $4,999.99 to $75,000. BOARD OF PRIVATE OCCUPATIONAL SCHOOLS BOARD MEETING. December 4, 2012, 9:30 A.M. I. CALL TO ORDER TELEPHONE CONFERENCE CALL MEETING MINUTES WEDNESDAY, OCTOBER 17, 2012 10:00 a.m. EST MEET-ME-NUMBER: (888) 670-3525 The meeting was called to order at approximately 10:02 a.m. EST by Mr.
BREVARD COMMUNITY COLLEGE BOARD OF TRUSTEES MEETING Occupational Bldg. #1, Lecture Auditorium 4:12 p.m. Titusville Campus PRESENT: Mrs. Miriam E. Martinez, Chair; Mr. James W. Handley, Vice Chair; Mr.
University Graduate Committee Minutes. April 16, 2012. A. The meeting was called to order by Dr. James Storbeck, at 2:00 p.m.
TELEPHONE CONFERENCE CALL MEETING MINUTES WEDNESDAY, JULY 20, 2005 10:00 a.m. EST MEET-ME-NUMBER: (850) 414-1706 I. CALL TO ORDER The meeting was called to order at approximately 10:02 a.m. EST by Ms.
PORTAGE LAKES JOINT VOCATIONAL SCHOOL DISTRICT PORTAGE LAKES CAREER CENTER ORGANIZATIONAL/REGULAR MEETING Tuesday, January 15, 2013 6:00 p.m.
MINUTES OF THE MEETING OF THE BOARD OF GOVERNORS. November 26, 2015. The meeting was held at 2:30 p.m. in Room 4155 Stevenson Hall. MINUTES OF THE MEETING OF THE BOARD OF GOVERNORS November 26, 2015 The meeting was held at 2:30 p.m. in Room 4155 Stevenson Hall. PRESENT: Mr. C. Shah, Chair Ms. I. Birrell, Secretary Mr. J. Adams Dr.
Councilman Rogers made a motion to approve the June 22, 2009 meeting minutes. Commissioner Brentano seconded the motion; the motion passed. KANSAS BOARD OF REGENTS ACADEMIC AFFAIRS STANDING COMMITTEE AGENDA. Conference Call September 3, 2013 11:00 a.m.
Roquita Coleman. Board of Commissioners Special Call Meeting Central Station, 545 So. Main Street Tuesday, July 15, 2014 5:30 p.m.
MINUTES. The February 17, 2010 meeting of the Utah Real Estate Commission began at 9:08 a.m. with Chair Hancock conducting. Thank you for seeking approval to offer an online degree program to students in Oregon.